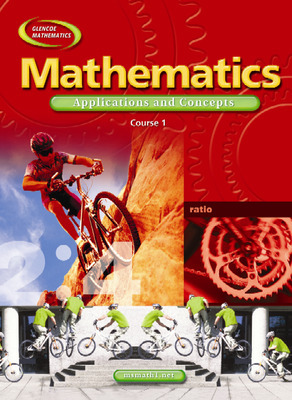 Help students of all abilities master the NCTM Standards using Mathematics: Applications and Concepts, Courses 1-3. This research-based middle school mathematics program is a balance of investigations, direct instruction, and real-world applications that provide students with opportunities for success in mathematics. Enhance reading and study skills with Foldables™. Foldables are unique hands-on study tools that aid basic reading and writing skills by focusing on the organization and analysis of main ideas and vocabulary. Motivate students and demonstrate the usefulness of mathematics in a way that relates to their interests. Real-World Applications—integrated throughout the text—are written in a relevant, engaging style. Focus students’ attention on key terms and math ideas with Key Concept boxes and Talking Boxes. Enable your students to prepare for other courses and to be successful in local, state, and national tests with Standardized Test Practice options. Expand your program with technology that is integrated throughout the program through an optional variety of instructions and activities that involve scientific calculators, graphing calculators, spreadsheets, and the Internet.